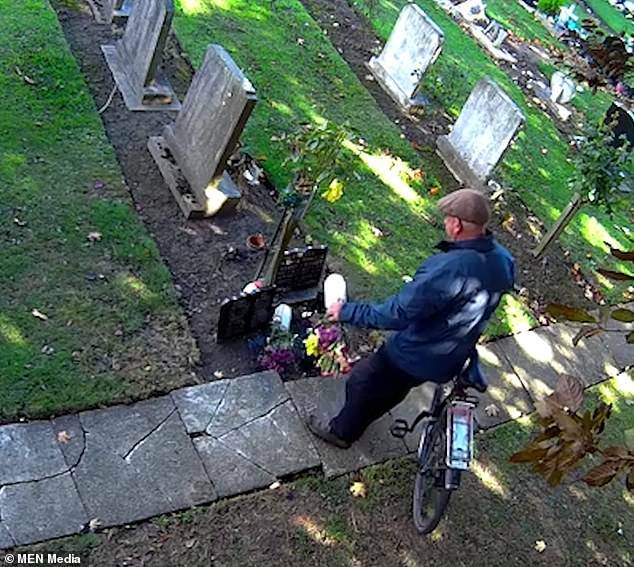 This is the sickening moment a man was caught stealing flowers from a family grave after friends set up a hidden camera when tributes started disappearing. Friends and relatives of Steve and Pat Russell who are buried at the grave along with their two young daughters noticed the flowers were going missing at the Eastern Cemetery in Hull. They installed a hidden camera in a nearby tree to catch the perpetrator in the act and say the thief has been stealing from the grave every week for seven months. One of the daughters, Kerry, passed away at the age of 12 after collapsing at school 31 years ago with a heart condition. Kirsty suffered from the same condition and died in 1996 at the age of 18. Four years’ ago, Patricia died after suffering a heart attack and her husband passed away a year later. They had their ashes scattered by a rose bush beside their daughters' grave at the Hull cemetery. Allan Hiley, 73, from Halifax, West Yorkshire, was 'horrified' when he was told by friends that someone was taking the flowers from their grave. He said: 'It's the grave of my auntie and uncle and their two daughters. I come over every now and again to visit the grave and friends who knew them. 'They rang me up a while ago to tell me someone was taking the flowers and decorations. I was horrified. 'The love that family had between them was incredible and the fact that someone could be doing that to their grave is a farce.